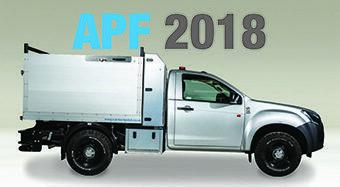 At this year’s APF show CPL will showcase both the Toyota Chipper Tipper and the Isuzu Chipper Tipper. Both come with full small series type approval, a 3.5t suspension upgrade, type approved tow bar and an extensive bucket capacity with a 5° tipping angle. Our engineers have worked very hard to ensure the CPL chipper tipper is a great workhorse but is also the work vehicle to be seen in when meeting new clients and quoting. The base vehicle of the conversion can be a variety of colour finishes and the complete unit comes with a full length lockable toolbox behind the cab, this has been designed specifically for tree surgeon equipment with a 180Kg capacity. There is also a 10kg side locker for an emergency first aid kit or a 50/50 can. Both are anodised to match the finish on the tipper bucket and to prevent the aluminium dulling over time.